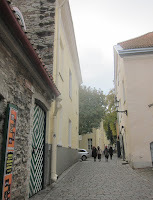 In a few hours the European Conference on Information Literacy 2015 will be opening in Tallinn, Estonia. I aim to be liveblogging as usual, but I won't be doing this for the opening session, since I am representing IFLA (International Federation of Library Associations and Institutions) and reading out a message from the IFLA President, as part of the opening. However, if the wifi is working, my liveblogging should start with Sonia Livingstone's opening keynote. I myself am contributing a paper and workshop, and two of my my PhD students are also presenting (Jessica Elmore and Evi Tramantza). The picture shows the street in Tallinn old town where I'm staying for the week (the stripey door leads into the building's courtyard).